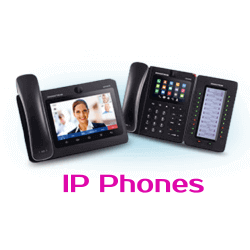 Grandstream CCTV IP video surveillance solutions deliver crisp, clear picture quality, integrated 2-way audio telephony features, full compliance with industry standards and broad interoperability with most service providers and 3rd party SIP-based VoIP products. To meet the varying application needs of customers for high definition/low light conditions, Grandstream family of products include model types ranging from CMOS & CCD cameras, tube cameras, fixed dome cameras, cube cameras, outdoor cameras and more. The Grandstream CCTV GXV3600 series of HD IP cameras offer indoor and outdoor cameras in a variety of shapes and casings in order to support all business and residential applications. Grandstream IP cameras feature full HD resolution, easy setup and management and can proactively notify users of security events through automatic outbound voice and video calls in addition to email screenshots. Grandstream’s ONVIF compliant NVR offers concurrent video recording and storage management.Grandstream Network Video Recorder can automatically discover, control, capture, record and play back high-resolution streaming video from Grandstream’s entire family of megapixel IP Video Cameras and IP Video Encoders/Decoders, as well as other 3rd party ONVIF-compliant IP cameras. Grandstream has a complete security solution offering consisting of an advanced central video management/storage system and a number of competitive IP video cameras for various indoor/outdoor deployment scenarios. The native integration of open standard SIP based VoIP technology in all of Grandstream’s surveillance products offers significant extra benefits for customers who also deploy VoIP solutions for their communication needs.